I started running at the tender age of 46 and have been at it, with some breaks, ever since. 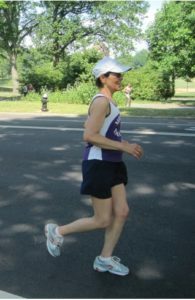 I am a proud member of the Mercury Masters, the only New York Road Runners team specifically for women age 50 and up. As an older, female runner, I understand the physical and psychological challenges all of us women face as we age. What Is “The Art of Running”? My teaching approach is based on Malcolm Balk’s program The Art of Running, which incorporates the Alexander Technique into running in a unique and creative approach. You will discover an easier, smoother, and healthier way of running. I am currently training to become a certified instructor of The Art of Running. You can find Malcolm’s book Master the Art of Running here.